Charles L. Brackins Jr obituary. Carnes Funeral Home. 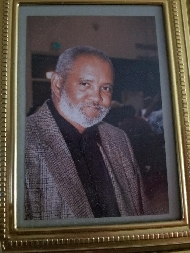 Charles L. Brackins, 66, of Houston, Texas passed away on Thursday, May 17th after a long illness. He was born in Crowley, LA on January 6, 1952, graduated from Ross High in 1970, served in the US Air Force, worked in the construction industry in the Houston area until he was disabled in 2010. He quickly became a life-long resident of Houston and worshiped at several churches during his life including Gethsemane Missionary Baptist, New Mount Carmel Baptist, and, at the time of his death, Holy Bible Way Baptist Church. Charles is preceded in death by his parents Johnson Brackins, Jr and Verneda Hebert Brackins and two older brothers, Johnson "Johnny" Brackins, III and Roy Brackins, Sr. Surviving siblings are Verna B. Brackins, Donnie Brackins, and Gina Brackins of Crowley. Also, to cherish his memory are his loving and dearest friend & partner, Joslin Hickerson of Houston, to whom the family extends our warmest gratitude for her kind spirit, one godchild, Trudy Lorick of Crowley, and a host of nieces, nephews and friends. The family would like to thank those that aided Charles in his time of need, especially his friends at Independence Hall, the Houston Police Dept., Carnes Funeral Homes, and the Harris County Bereavement Program. Private funeral services will be at a later date in Houston with internment at a VA Cemetery in Texas. Carnes Funeral Home, 1102 Indiana St., South Houston.